Only minutes after meeting entrepreneur Ed Kaplan (ME ’65) for the first time, Dane Christianson (ME 3rd year) says it was clear that Kaplan is deeply committed to students. The two first met earlier this year at an event announcing Kaplan’s latest gift to IIT: a $10 million challenge grant to help build the Ed Kaplan Family Institute for Innovation and Tech Entrepreneurship. John Ronan Architects and Shepley Bulfinch will design the building, which is slated for completion in 2017. The co-founder of Zebra Technologies, a manufacturer of on-demand bar code and RFID labeling and ticketing systems, Kaplan says while pursuing his mechanical engineering degree at IIT, he discovered that “the intersection of engineering and business could provide many opportunities.” He redirected his career path late in his senior year from a master’s in electro-mechanisms to an M.B.A. at the University of Chicago. Kaplan worked days as a research and development engineer at Teletype Corporation, a data communications company, while pursuing his degree at night. It became clear to Kaplan that he wanted to become an entrepreneur and his own boss. At 26 he left Teletype to pursue his dream and started Data Specialties, which later was transitioned into Zebra Technologies. Christianson, inventor of the X-Cube twisty puzzle, told the crowd attending the gift event that he has a few things in common with Kaplan: both started businesses in their 20s, both belonged to fraternities, and both studied mechanical engineering—but 50 years apart. Christianson rejoined Kaplan in April to ask him how the new institute will impact IIT students 50 years beyond Christianson’s own commencement. Christianson: Your gift is a really big deal—a game changer. 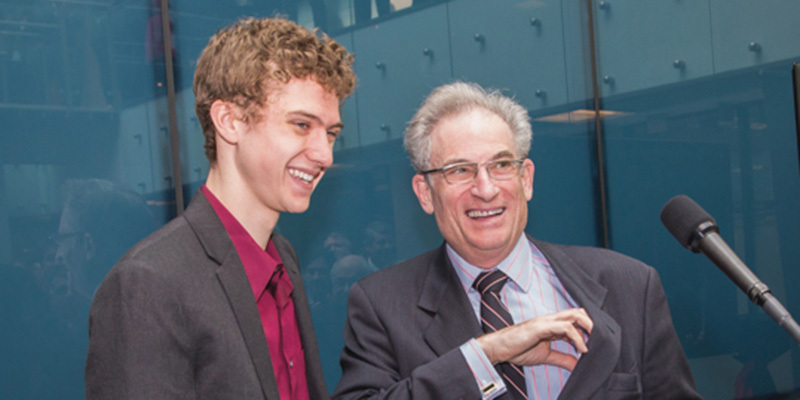 What do IIT students have to look forward to at the Kaplan Institute? Kaplan: The most important thing about what we’re doing is that it is for the students. Our graduates will acquire a capability to innovate that will be superior to any other technical university and will lead to a lifetime of career success. Some will become successful entrepreneurs. The endgame for students is that they will be able to get jobs that they will find very satisfying, will be very good at, and will be passionate about. What we will do at the Kaplan Institute is enable them to be very, very productive in achieving their personal and professional goals. If you can go ahead and put somebody in a position where they could do what it is they want to do and it’s something that makes them happy and productive, then they will need the tools to enable themselves to go forward and change the world. Christianson: So you don’t think we’re doing that now? Kaplan: I assume that you are asking what IIT is doing now. IIT currently has an Institute of Design (ID) that is located in downtown Chicago. It was started in the 1930s. It only grants graduate degrees, and it is believed to be the best design school in the country. The faculty teach design methods and how to solve problems. We expect to house ID in the Kaplan Institute on IIT Main Campus. Undergraduates will be able to access their teachings. Our Interprofessional Projects (IPRO) Program and Idea Shop will also be moved to the Kaplan Institute. This past spring semester, there were 70 teams with a total of 750 students working on IPROs. IIT also has a Leadership Academy and an Entrepreneurship Academy (EA). We intend to build the EA into a world-class tech entrepreneurial center that will provide a wide range of academic courses as well as exposure to distinctive programming in experiential learning. So you can see that everything is under one roof. All undergraduates will be required to participate in coursework in this building. There will be collaborations between professors, researchers, and students from all disciplines. This is our vision for the future at IIT. Christianson: I get what tech entrepreneurship is about—where technology and business meet—but could you explain a term you mentioned at the gift event: tech ecosystem? Kaplan: A tech ecosystem is typically made up of technology-based companies, universities, and research institutions as well as other components, such as the government, which is a key player in its creation. Chicago happens to be sitting in the middle of a triangle of tech ecosystems delineated by Austin, Texas; Silicon Valley; and Boston. The Kaplan Institute can play a leadership role in developing the tech ecosystem of the Midwest. Christianson: If this gift had been given when you were an IIT student 50-plus years ago, how would your life have been different or improved? Kaplan: I’m not sure that my life would have been different or improved; however, I do think that a significant number of people derive benefit directly and indirectly through what such a gift makes possible. In my case, I’ve always loved taking science and engineering courses because I learned how to solve all kinds of problems, not just engineering problems. I learned to answer the questions “why” and “how”—not just “what.” But there were other courses at IIT that blew me away. My intro to economics course taught me fundamental business principles, such as how the banking system created money and about the concept of inelastic supply and elastic demand. The engineering economics course introduced me to a tool that taught me how to evaluate the purchase of a piece of major equipment or make sound real estate investment decisions. At the Kaplan Institute, we will provide pathways, giving students a menu of practical, useful, targeted courses that will help them pursue their entrepreneurial interests. We will give our students opportunities to learn from the experiences of others as well as through hands-on learning. We will teach our students how to convert an idea into an innovation and then commercialize that innovation or use that innovation to save lives. No single university in the United States has a program that will be as robust as ours.